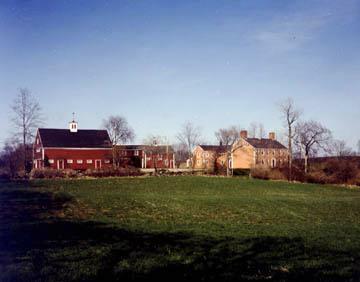 Cogswell's Grant was the summer home of Bertram K. and Nina Fletcher Little, preeminent collectors of American folk art in the mid 20th century. In 1937, the Littles purchased this 18th-century farmhouse overlooking the Essex River as a family retreat and place to entertain. They restored it carefully, preserving original 18th-century finishes and carefully documenting their work. In more than 50 years of collecting, they sought works of strong, even quirky character, and in particular favored objects with their original finishes and New England histories. The Littles decorated the house for visual delight rather than historic accuracy. The result is rich in atmosphere and crowded with collections of things -- primitive paintings, redware, painted furniture, stacked Shaker boxes, weather vanes and decoys -- that have since come to define the country look. Open for tours June 1st - Oct. 15th, Wed. - Sun., 11am - 4pm. Cogswell's Grant is a property of Historic New England, the oldest, largest, and most comprehensive regional preservation organization in the country. It operates thirty-six historic sites, offering unique opportunities to experience the lives and stories of New Englanders through their homes and possessions.